I wanted a warm yet lightweight jacket to wear on those chilly mornings or evenings. In an écru shade, to go with everything. 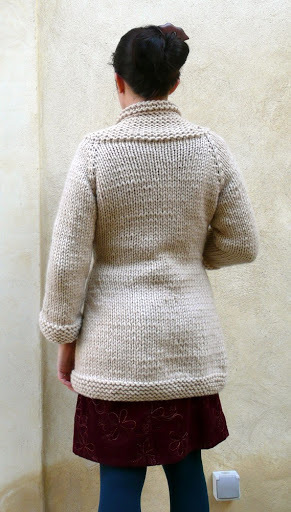 I settled on a pattern for a cardigan, Iced, from the Knitty website; since I wanted to make a jacket/coat, I chose a thicker yarn and needles to get a sturdier fabric; and I made it longer. This means I added a few increase rows over the hips, and of course adapted the pattern to my larger gauge. I’m really happy with this – it is exactly as I envisioned it. I’ve been wearing it all the time. I was hesitant about buttons, and have been using a shawl pin to close the jacket; but I do feel buttons will be more practical, so I’ll add a couple soon. Pattern: Iced, by Carol Feller, with alterations to fit my larger gauge. Yarn: Rowan Big Wool, a bulky yarn; I used 7 balls (= 555 metres / 600 yards); in Linen. My project page and pattern notes on Ravelry. 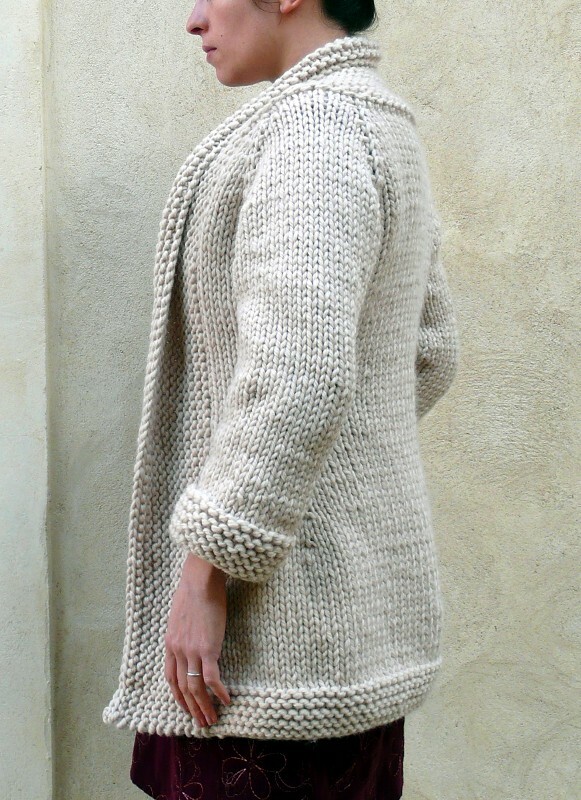 The yarn is super soft and cosy, making it a favourite of P’tite Mignonne’s. At one point she just sat on the project and plainly refused to let me pick it up and knit it. Though she doesn’t look it, especially not in the above picture, she is able to throw quite the tantrum. 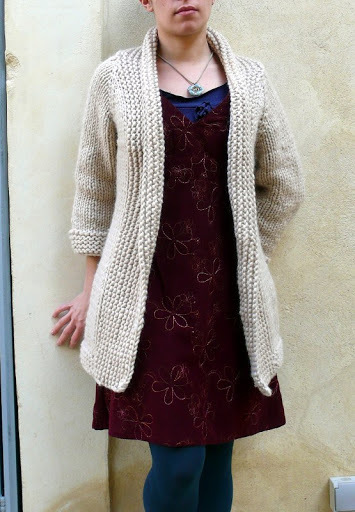 Very pretty cardigan, warm and cozy for those chilly days. Warm and cozy and lovely. What a sweet picture of P'tite Mignonne too. Oh, that looks so warm and cozy. It is just right for the cool mornings and evenings. If your pretty kitty loves it, it must be very wonderful. i cant believe how big petite mignonne is! she's so pretty! oh my!!!!! Your jacket is awesome!!! I love it!! It looks lovely are cosy. I can see that P'tite Mignonne loves it too. 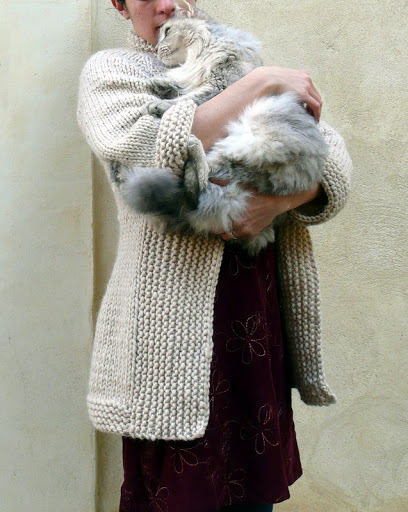 Very pretty knitting and nice to see P'tite Mignonne appreciates it. Je suis en train de me faire un pull (qui monte bien vite, c'est agréable!) avec de la laine trouvée ici: http://www.filatureduvalgaudemar.com/vmchk/Laine-%C3%A0-tricoter.html. Je ne sais pas si tu connais, mais ils ont de superbes matières! Je t'embrasse bien fort, à bientôt! Hello my dear Isa ! I like your new jacket very much ! Have a nice day, with such sun, I feel like in summer ! Can you please tell me what your new gauge is? Thanks! Your jacket is really stunning.